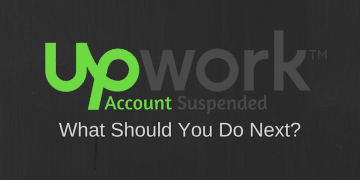 You are here: Home / Freelancing / Upwork / Upwork Account Suspended – What Should You Do Next? 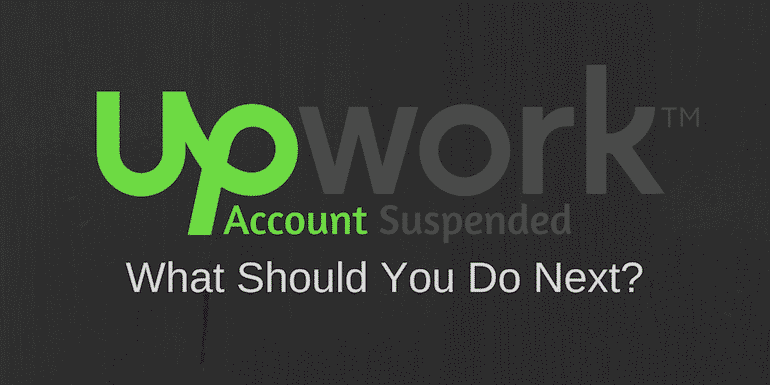 Upwork has recently up the ante of suspending accounts. 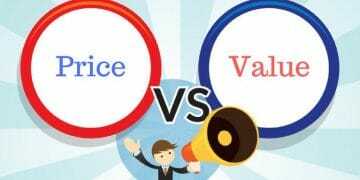 I think it is definitely for the betterment of the marketplace. Many freelancers got their accounts suspended for various reasons. 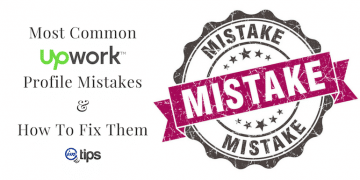 I will share the most common ones here but for a complete list check this link on Upwork. These reasons I gathered by interacting with a couple of my Upworkers friends whose account is suspended recently. 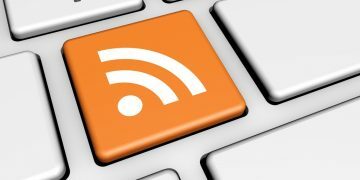 as well as going through some of the threads posted by the suspended users in Upwork community. 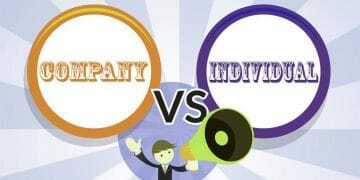 The most common reason for accounts getting suspended is sharing your contact details either in profile or in the portfolio or with the proposal. You should be fine sharing links to the sample project, but it should not link to your blog’s contact page or where you have your contact information very prominently displayed. Don’t see a reason to do it either. I prefer the other way around where I want my blog readers to hire me on Upwork. 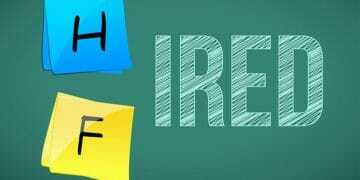 I have many clients from my blog who hire me on Elance and Upwork. They create a personal project only for me, and it is so much more convenient for me to be working on Upwork. 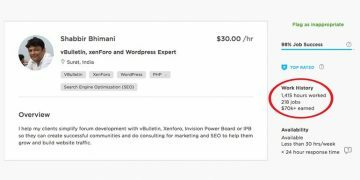 I link to my Upwork profile and my past feedbacks boost clients the confidence to work with me. 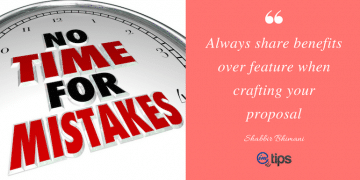 Clients feel safe with escrow and pay if the work is delivered as per their needs. You feel safe and confident with money already in escrow. 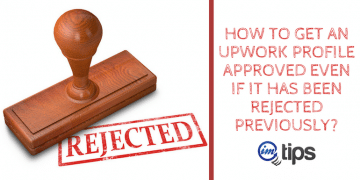 And don’t miss to check out: How to Get Upwork Profile Approved. Asking clients to give you a 5-star review instead of honest feedback is one of the other primary reason I found freelancers account getting suspended. Upwork has an email notification system that sends an email to both parties to leave feedback. So, as a freelancer, you don’t even need to request a review. But if you do, ask for an honest feedback. It helps you become better at what you do. On top of that, it can save you from being suspended. 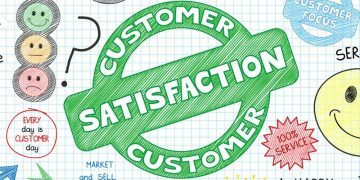 Take a negative review with a pinch of salt and try to work your way of not repeating the mistake instead of asking for a 5-star review when you know you don’t deserve it. It is an email one of my blog readers got when his upwork account was suspended. There is very little that one can do after you get such an email. The reason why the account is suspended is obvious. It happened to my friend because he submitted almost the same proposals to all the clients. Applying for too many projects without success means you need to learn to write better proposals. 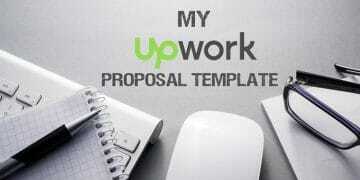 Here is how I write my Upwork Proposals that lands me a project almost every time. I remember my Elance account was limited once. It required verification in 2008ish time when my brother also started with Elance. We both used to work from our home which meant we had same IPs / ISP. Have very similar expertise of vBulletin and our surname also matches. So we both have to get our accounts verified. It was all good then. 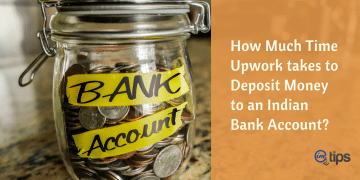 The reason to share this is having more than one account is always against the rule of Elance and Upwork terms. As a freelancer, If you wish to hire someone, add a client account under the same login and don’t try to get a separate account. If you think you can trick the system, it is tough. 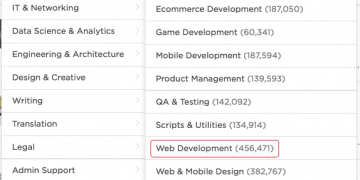 With so many data points from so many users accessing the site daily, Upwork knows a lot more than you. They know about the common proxies and VPNs and so don’t try that path. Also check out: Ways To Receive Payments for Indian Freelancers. Once your account is suspended, it is gone forever. There is very little one can do now. Still, the consensus is, there is a 1% chance of chance of account getting restored. 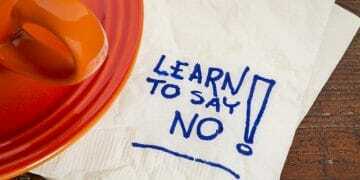 Take that chance and confess what you did was wrong but were unaware. As long as you are not trying to manipulate the system and are doing things ethically correct it should be all fine. Still do not overly rely on only one site. I have been relying heavily on Upwork but will start building my profile on other freelancing sites. I have been using Upwork for over two years. The first year I didn’t use it much, just to look for what kind of jobs I can find here as I had my full-time job I didn’t need it anyway, Howver as I recently quit my full-time job I started using Upwork for the last months – I have applied for many jobs but never exhausted my available connects (not even 50% of them). I did get only one job (for 500$) in the last few months of applying for contracts due to quality reasons. 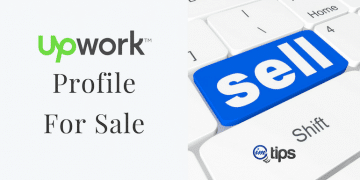 Here on Upwork many people are looking for the lowest rates and not for the highest quality so for people offering the best quality it is not so easy to find a client – but the rate is higher too which means Upwork gets more money from that as well. Anyway if this is the reason my account got suspended I could understand (even though it’s very silly and doesn’t break any rules as I didn’t use even 50% of my connects). But I’m pretty sure that’s not it as no reason was given at all. 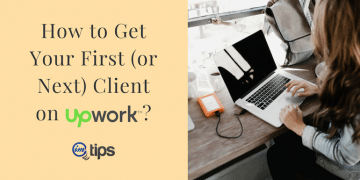 I also never made any client’s work outside of Upwork. There were some clients asking me for Skype contact information because they wanted to make a video call but that never happened and all of my work from Upwork was done at Upwork. 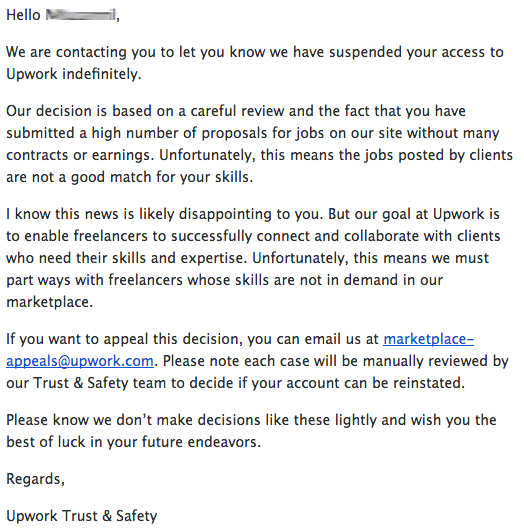 Again I can understand if the people from Upwork tell me that they think maybe I’m doing work outside of Upwork and breaking the rules but that was never said or expressed from them, they just decided to suspend the account and don’t tell anything. So I’m left in the dark let to assume what did I do wrong when I didn’t do anything wrong.. So after my account got suspended I contacted the customer support and after several days I got a reply asking why my account should be reinstated and that I need to provide additional documents about my education, work etc… Why is this required after two years of not having issues with any of this? Nobody knows. Even if you have followed all their instructions, there is no guarantee that your account won’t be suspended. I am also a victim and nothing really helped. I gave up requesting them to activate my account. 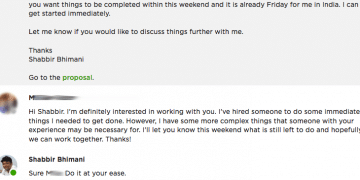 Upwork is minimizing new joiners by rejecting their profiles. In some sense, they stopped taking new freelancers, don’t you think this strategy will be poisonous for themselves as they won’t grow further? Last thing is, there are several hundreds of new websites providing much better services on reasonable commission rate and enhanced features, how would upwork compete with them in coming future? When checked toogit.com, I was amazed with the features they are providing. I think in coming future, upwork would not be as popular as it is right now. Some new players will be miles ahead of upwork. I am not sure they are rejecting everybody but may be screening down to reduce the number of freelancers because at times when you post projects that are quite common in nature, clients may want to be doing too much screening of freelancers which may be tough for many.